If you’re a app developer or online merchant that uses Stripe to process your customers, you can now get some pretty nifty alerts thanks to a partnership between Stripe and If This Then That. For instance, every time you make a website sale, an IFTTT recipe could trigger an SMS message to your smartphone – or better yet, you could use rig a LittleBits speaker to play the sound of a ringing cash register. There is a more button-downed side to the partnership as well. IFTTT is tapping into Stripe’s notification and management systems and tying them to productivity and communications apps. Every transaction and new customer information could automatically be logged on Evernote or a Google spreadsheet. Or every time a payment is disputed, a text alert could be sent to the appropriate team member. Those might not sound like the most interesting ideas in IFTTT’s growing rolodex of cross-application recipes. But they’re very useful for e-commerce businesses, IFTTT co-founder and CEO Linden Tibbets told me — especially for small operations that are trying to attract their first 1,000 paying customers and aren’t planning to invest in CRM and sales tracking software. Stripe may be known for powering the payments of big sharing economy startups like Lyft, Shopify and Instacart, but it also serves thousands of startups just getting their bearings on the web and mobile. The partnership also shows that IFTTT, known very much for its consumer focus, is getting serious about small business, something its lesser-known competitor Zapier has made its primary focus. In July, IFTTT and Square announced a similar deal, creating a link between brick and mortar retail and web apps and the internet of things. 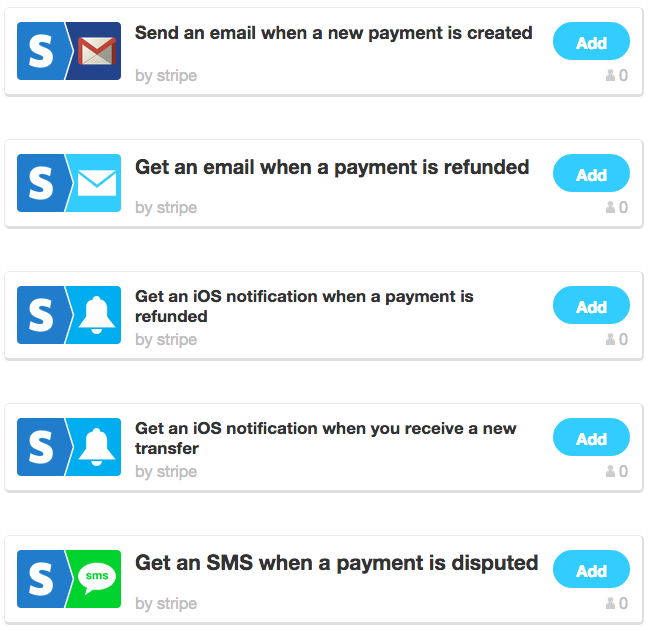 The Stripe channel is now live in IFTTT, offering five different recipes for creating sales, refund and transfer alerts. But any merchant who wants to get creative can create ties between its sales data and a hundred other IFTTT channels.